One of my favorite Michael Pollan Food Rules is “Eat all the junk food you want, as long as you make it yourself.” I think this rule applies even more broadly than just to junk food. Any food is going to be better for you (and likely better-tasting) than a premade version. So this weekend, when I had my usual cravings for pizza, I decided to put my mouth where, well, my mouth is, and just make it myself. 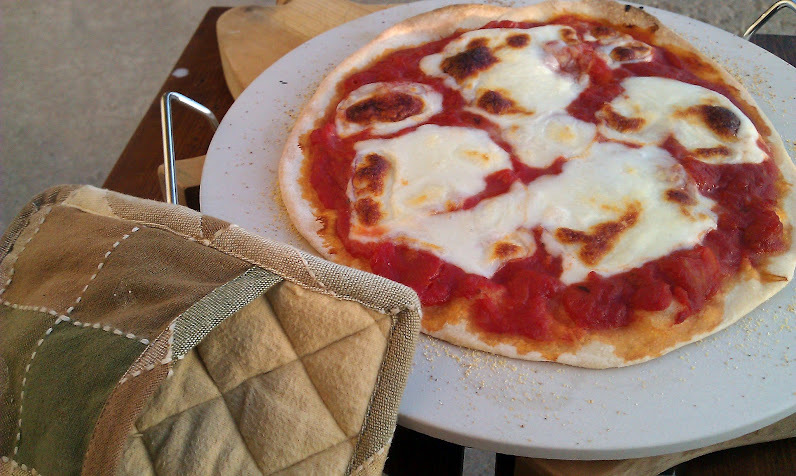 I had homemade pizza dough in the freezer, fresh mozzarella and canned tomatoes, and that was all I needed. 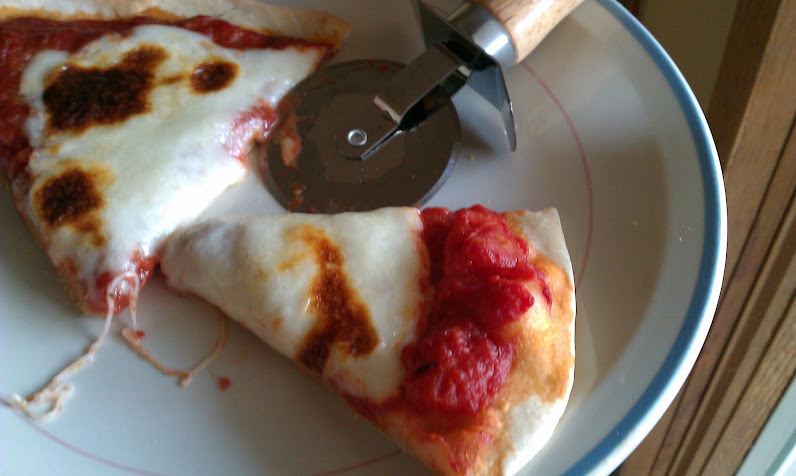 I used Kim O’Donnel’s basic pizza dough recipe, and roughly her method for making easy from-scratch tomato sauce for the pizza, which is as simple as simmering tomato puree with a little paste to thicken it, along with any herbs and spices of your choice. You could even use fresh tomatoes and puree them yourself with an immersion blender. I used canned diced tomatoes and half-mashed them while the sauce simmered, because I like a little chunk in my sauce. 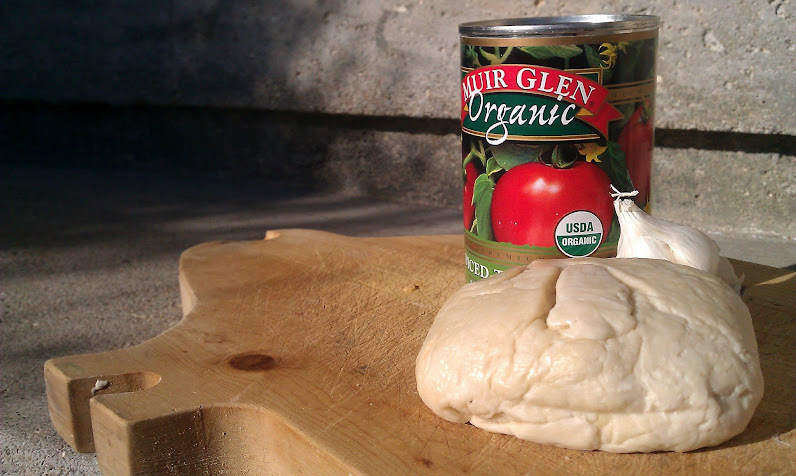 (While I try to avoid canned products in general (BPA freaks me out), in the cold weather months, for a cooked recipe, I opt for organic canned tomatoes over bland conventional tomatoes flown in from South America. ) Add a handful of slices of fresh mozzarella, and voila! You’d be hard-pressed to convince me that just ordering from Domino’s is much easier, especially when you take into consideration that the dough and sauce can be made way ahead of time and stored, even frozen. You could also cut down prep time by making your dough hands-off, in a bread machine or stand mixer. Then dinner is as simple as rolling it out, throwing on the toppings and baking. 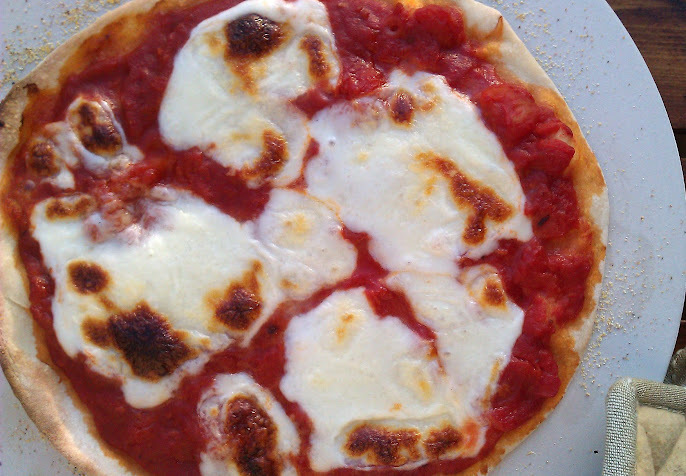 I know plain old tomato, mozzarella pizza seems like a boring recipe to share, but this is one of those places to make an easy switch in your eating habits. Imagine knowing the ten or so ingredients in your pizza were all fresh, whole foods that fuel your body — rather than a delivery or frozen pizza that leaves you feeling heavy with grease and guilt.